Do you need a break? Is it time to relax? If you need downtime, there is a good chance Fido just might like to relax with you. Learn a new way to help your dog relax when you make a calming lavender dog collar. Although scented collars can sometimes be found at specialty dog boutiques, you can save a little money by making your own lavender collar. Why not make your own homemade lavender relaxation dog collar that will help calm Fido after a crazy, busy day? The bonus is that you get to enjoy the beneficial scent of lavender too. Assembly time is about 45 minutes. First, make sure the collar you select provides a comfortable fit for Fido- not too tight or too loose. Next, cut cotton fabric to the width of your collar. Place the fabric around the collar, being sure to pin it in place so you have a line to follow as you sew. This keeps the fabric from slipping. Once you have sewn the fabric around the collar, you are now ready to add your scent. 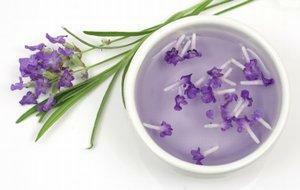 Simply place the collar in the bowl of lavender oil. Make sure the fabric really absorbs the oil. Another option would be to add drops of lavender oil along the fabric until it is fairly saturated. A little pure lavender goes a long way, and this method give you better control over how strong the resulting scent will be. Allow the collar to air out for a bit to let it "cure" before putting it on Fido. Now you have a wonderful aromatherapy collar both you and your dog can enjoy. Even when the weather turns cool, using this collar will help you and Fido dream of the lush scents of springtime. You can keep the collar on your dog all the time if you wish, but it may be more effective to save it for special times when you want your dog to relax. To clean the collar, simply wash it in warm water on the gentle cycle, and then let air dry. You can then reapply oil as needed.